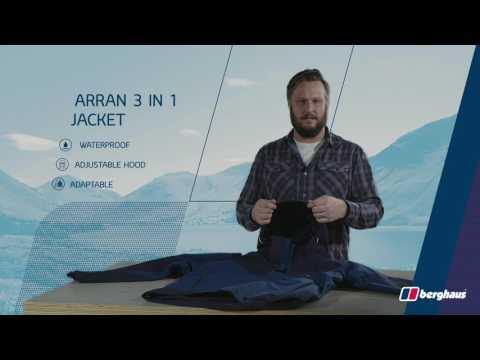 You can’t always rely on the weather – but you can rely on the Arran 3in1 to see you through your adventures. Named after one of Scotland’s most spectacular islands, this amazingly versatile jacket is designed for walkers and hikers who want to hit the trails all year round, whatever the weather. Combining a Hydroshell® Elite fabric outer with a removable fleece inner, the Arran 3in1 allows you to adapt to the conditions. Stick on the waterproof outer alone in wet but milder conditions or just the removable fleece when it’s colder but dry. Alternatively, keep both pieces zipped together for an ideal full-protection layering system when winter sets in. PROTECTED WITH HYDROSHELL® - Our fully breathable and waterproof Hydroshell® Elite fabric keeps you dry and protected when the weather turns. The centre-front zip is covered for additional waterproof protection. ESSENTIALS IN REACH - Keep your vital bits and pieces close at hand using the four pockets, including zippered internal map pocket and two hand-warmer pockets. The adjustable hood with wired peak offers further wet weather protection and can be neatly rolled away when not in use, while articulated sleeves give great ease-of-movement. Fleece fabric and hand-warmer pockets offer enhanced warmth and comfort. Stretch binding at the cuffs, hem and hood opening provides a closer and more comfortable fit.